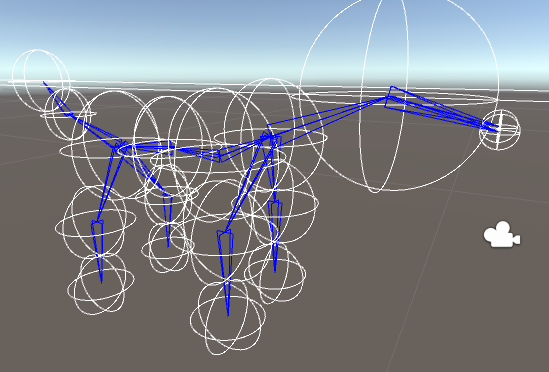 Disable "SkinnedMesh" or "StaticMesh" to see metaball structure (and bones for Skinned). 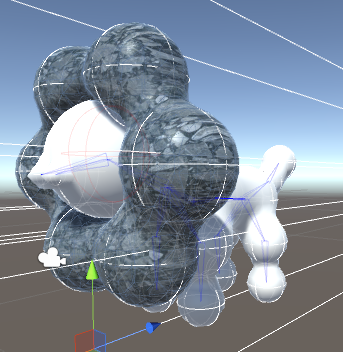 Just copy GameObject tree under "SourceRoot" to other MetaballSeed (Static or Skinned) and the metaball structure is ported. But some parameter modification on seed may be required. One metaball mesh can be rendered with only one material. But you can simply combine ones (although they are not blended). After you created your mesh, some of GameObjects and Components can be deleted. Although the mesh will not be modified, doing this helps you publish your model data without dependency on this asset. CellObjPrefab can be used in various ways. In most case, it is because of exceeding the limitation of the number of grid cells. "Too many grid cells for building mesh (1168200 > 1000000 ). Make the area smaller or set larger (MetaballSeedBase.gridSize)." To solve the error, follow the message. (the capacity depends on the spec and condition of your system). Mesh has been leaked (some number) times." But it seems that there are no actual leaks in usual case.